Thoran is a coconut based vegetable curry from Kerala. It is one of the dishes served for Onam Sadya. 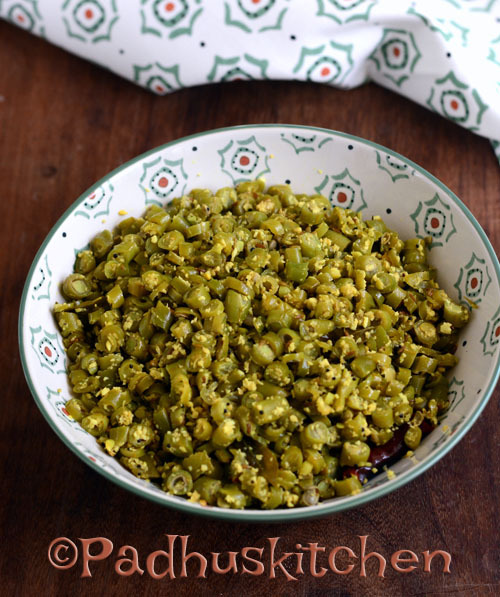 Beans thoran is a simple and nutritious stir fry which goes well as an accompaniment with rice. Thoran can also be made with other vegetables like pumpkin, carrot, cabbage etc. Today we will learn how to make french beans (green beans) thoran following this easy recipe with step wise pictures. Sting the beans, wash it and chop it into small pieces as shown below. Grind/pulse coconut, green chilli, pearl onions, garlic, turmeric powder and cumin seeds just for a second. Heat oil in a pan, add mustard seeds, when it splutters, add red chilli and curry leaves. Add the coconut mixture and cook for 2-3 minutes on low heat. Add the chopped beans, salt needed and mix well. Sprinkle water and cook covered, stirring from time to time until the beans becomes tender. You may sprinkle more water if required, in between to prevent it from getting burnt. Enjoy delicious Beans thoran with steamed rice. Note - Use coconut oil for authentic Kerala dishes. You can omit garlic and pearl onions, if you do not prefer. Hello! Thank you for your recepie. Every time I make a dish with beans, the raw taste/ smell of the beans remains after cooking is done. Any remedie to get rid of the raw smell?